The aim of the Gatlet project is to implement an interface for portlets accessing Grid computing resources through the Grid Application Toolkit (GAT). The advantage in using GAT is that it provides access to all three major Grid middlewares (Globus Toolkit, UNICORE and gLite) through one common interface. Since Gatlet is JSR 168 compliant it should work with any JSR168-conform portal. 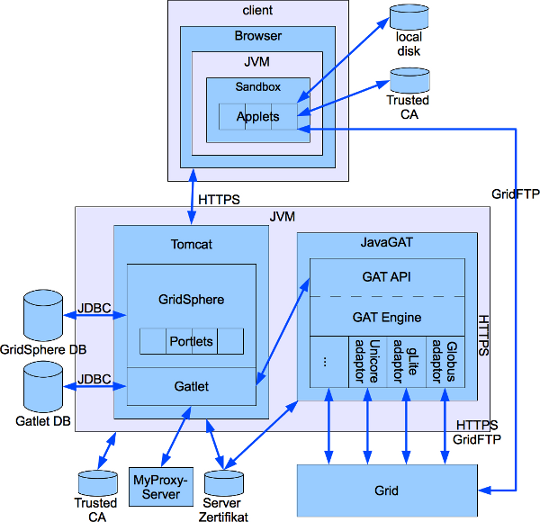 Gatlet is implemented and tested within the GridSphere portal framework. The diagram below shows the structure of Gatlet in the context of GridSphere and GAT. The design of Gatlet enables the Portlet programmer to easily use any supported Grid middleware as well as to switch to more recent tools like JSaga later. See Gatlet_NGI_DE (245 KB) for a talk about Gatlet given by Stefan Bozic at the Karlsruhe Institute of Technology (KIT).